Timestopper, arguably the best Runasdate alternative out there.Looking to reset the trial period of any software and extend its license for a lifetime usage? Runasdate, the best solution for you. Do you know you could actually reset the trial period of any software and extend its license for a lifetime usage? Ever been searching long on Google on - How to reset trial software? Hop in! let's do this in a quick and stress-free way, no much coding or need for the techy background to do this. This is just for testing purpose, you can always get the full version of a software to avoid being locked out. For windows, there are pretty many thousands of reset-trial-period software’s available on the internet one can download. But most of them are not free or in most cases, you are only limited to downloading its trial version. But as we all know this trial version is always limited and therefore we are required to purchase the premium version for using that version on a PC. But in this post, we will be discussing the possible ways one can extend the trial period of any software in your Windows PC from just a simple hack. With this trick, you don’t need to pay anything to anyone for using the premium software on your PC. In this post, you are to reset the trial period of any software on your PC using this two known software. First is the RUNASDATE and the second is the TIMESTOPPER. This software’s are the best for this task. Runasdate! pretty weird name isn't it? This is small utility software that allows you run a product under the date specifications you give it or specify it. It is worthy to note that this software does not change the date or current time of your computer system, it only injects the date and time which you specify for a particular program to run. Runasdate trial resetting app allows allocating different time and date for any program on your computer to run simultaneously without altering the main date and time of your PC. Install runasdate computer software on your PC. Now run any trial software on your Computer and write down the date of installation on your PC. With the help of this software, you can use any software on your PC for a lifetime without spending any dime. Just right-click on your software and select runasdate. Timestopper trial period reset software is a good alternative to the runasdate although both perform the same task on a PC. You can download Timestopper on their website. They freeze the software so that you can use the supposed trial software for a lifetime on your PC. 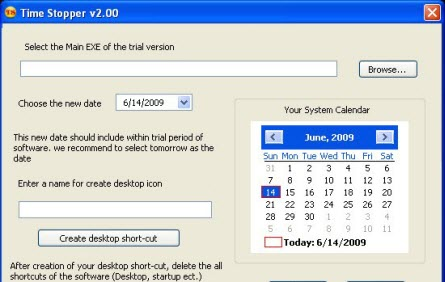 This is software which eliminates the already existing time limit in trial usage software. It works with any software executable file and practically will extend the trial period of any software for unlimited time. Using these aforementioned software’s, you can easily hack and reset the trial period of any software in your PC and use it for a lifetime. Nb: Any suggestion or another way resetting the trial period of any software is also welcome in the comment section.